Do you love risotto? Have you ever had it? If not, now is the time to change your ways. Risotto is a unique rice dish in that, despite the lack of cream or milk, the rice cooks up to be creamy and downright delicious. Unlike “normal” rice that you can simmer, cover and leave to work its magic, risotto does require constant stirring while continuously adding small amounts of liquid until each portion is absorbed. The end result is worth it and far superior to regular white rice. This particular variation comes from my husband’s coworker who graciously shared the recipe with us. The combination of salty ham, crunchy sugar snap peas and parmesan cheese is perfect for a light, summer meal. I served this with a crusty roll and called it good. Cook peas in boiling water 2 minutes or until crisp-tender. Drain and rinse with cold water until the peas are no longer warm to the touch. Heat oil in a large saucepan over medium heat. Add leek to pan; cook 5 minutes or until tender, stirring frequently. Add garlic; cook 30 seconds. Stir in rice; cook 1 minute. Add 1/2 cup chicken broth and cook 2 minutes or until liquid is nearly absorbed, stirring constantly. Add remaining broth 1/2 cup at a time, stirring constantly until each portion of broth is absorbed before adding the next (about 20 minutes total). Add ham to pan; cook 3 minutes or until thoroughly heated. Stir in peas, cheese, and pepper. Serve immediately. I one-and-a-halved the recipe to feed my family of two adults and three children as a main dish. I’d never made risotto before, but you gave me the courage to try, and everyone loved it. So delicious! I subbed asparagus for the sugar snap peas, and it turned out beautifully. Thanks, Mel, for another great recipe. This is one of the first recipes I tried on your site, and it is a slam-dunk. Since that first time, we’ve had it about every other week. It is even what I made for my husband on our anniversary (it’s his favorite). Thanks again for another great recipe! I just made your risotto tonight, my first time making a risotto. It was awesome, I had a guest over and it disappeared between the guest and my family. We loved it, thanks for the recipe! 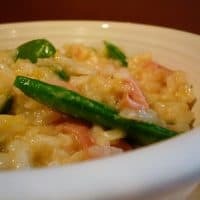 I would love to try risotto, especially this recipe! I gasped at the price of risotto…where do you purchase yours? I am going to have to give this a try. I have not mastered the making of a risotto yet, but hopefully your recipe will be the one. I love risotto… And yours looks yummy! Just wanted to tell you that I am linking to you on Friday and your baked Oatmeal. Thanks!! I have actually tried a recipe similar to this one using asparagus and prosciutto and loved it. My husband’s not a huge fan of asparagus, so I will have to try yours next time. i’ve had risotto, but i’ve never made it. i’m all about anything containing sugar snap peas right now, so by definition, i’m crazy about this dish! 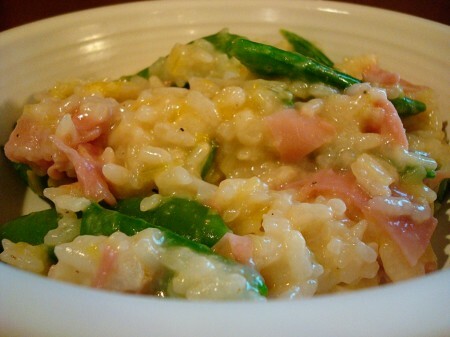 Never made risotto at home…the one that you feature looks so yummie…creamy…delicious. Have to try it! 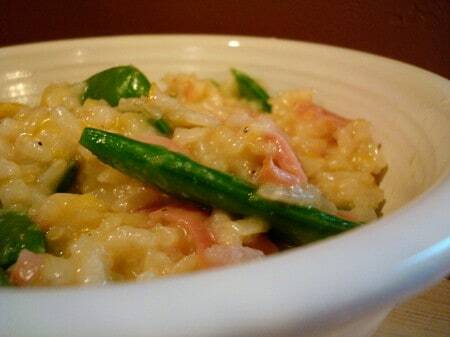 Ham in risotto sounds unbelievably delicious. Yum!